Another week and we are really no closer to settling this sixth AFC spot. The fins took a big step towards it, but we still have those Titans (who if you’ll recall, I said was the team with the easiest path… way to take advantage of that, fellas) hanging around, and, despite being a blight upon humanity, the Jets are still in the hunt. I can editorialize very easily, thanks. The titans actually have the sixth seed on tie breakers, and the Jets and Dolphins are actually at the bottom of the mass of 5-6 crapitude. But the Stats in the Wild formula gives the Dolphins the best chance. I think it helps that the Jets and Dolphins face off twice, that SHOULD (and this is not a promise) clarify things slightly. Now watch them split. 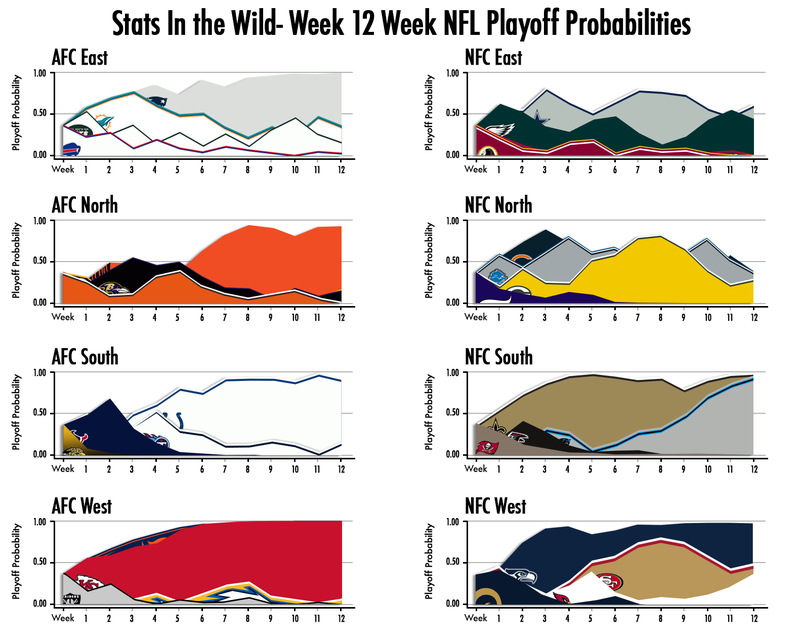 Over in the NFC, the Cards continue their slow creep, and the niners, once in a very very strong position, now in a weaker position (I’m a regular Wordsworth.) The Lions are currently in the drivers seat; thanks to two wins over the Bears and a win over the Cowboys they are actually the current three seed, despite a 6-5 record. Enjoy no advantage Carolina, despite your third-best record in the NFC. But, geez, is that NFC North a mess. Any of those three teams can take it, and they must think they’re vying for an AFC Wild Card, since no one seems to want it very much. I’d write more, but it’s Thanksgiving Eve, and in a half day, this is mostly irrelevant when the Packers play the Lions. Someone has to win. But then they can lose the following week and I type the same stuff again. Posted on November 28, 2013, in Uncategorized. Bookmark the permalink. Leave a comment.